After reviewing dozens of applications from across the state, the Minnesota Retailers Association is pleased to announce the community of Alexandria, MN as the Retail Community of the Year in the 2018 Minnesota’s Retail Champions program. Representatives from Alexandria will accept the award in person during the Retail Rally event on Tuesday, October 9, 2018, at the Doubletree Hotel in St. Louis Park beginning at 2:30 p.m. The event features a keynote speech by Amanda Brinkman, “Retail Lessons Learned While Revitalizing Main Streets Across America”. Brinkman is chief creator and host of the “Small Business Revolution - Main Street”—a critically acclaimed HULU series celebrating small businesses and revitalizing main streets across America, and chief brand and communications officer of Deluxe. Alexandria is the sole recipient of the Minnesota’s Retail Champions Retail Community of the Year award. Nine other organizations will be recognized in other categories such as Retail Innovation, Advocate of the Year, Retail Employee of the Year, Social Responsibility and Retailer of the Year. 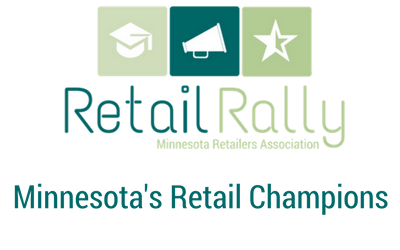 The Minnesota Retailers Association (MnRA) proud to announce the winners of the 2017 Minnesota’s Retail Champion Awards. Winners will accept their awards in person during the inaugural Retail Rally event on Wednesday, Oct. 4, 2017 at the Opus College of Business at the University of St. Thomas (1000 Lasalle Ave,, Minneapolis) beginning at 5:15 p.m. The Minnesota Retailers Association started the award process by putting out a statewide call for nominations in the 12 categories. A panel of peer judges reviewed nearly six dozen nominations and selected the top nominee in each category. Tickets to the reception and awards are available online at RetailRally.com.